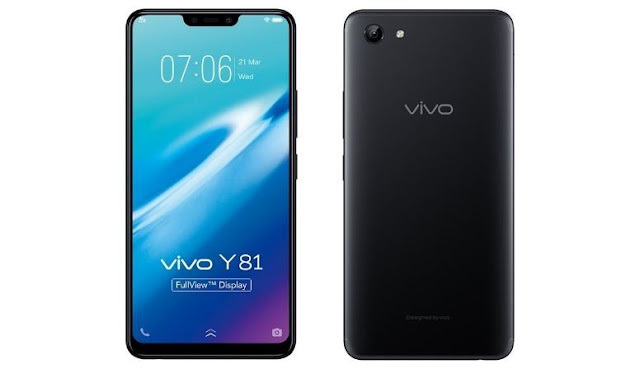 TECHNOLOGY-PORTFOLIO.NET - Vivo Y81 is an android phone again top and also not behind FullView Display screen with 19: 9 ratio that promises better multimedia satisfaction. Vivo include a fairly decent specification but with a fairly affordable price and only slightly different than Vivo Y83. Vivo Y81 has a 6.22 inch screen with Octa Core CPU from Mediatek MT6762 Helio P22 clock 2Ghz, then 3GB of RAM memory, and 32GB of internal storage and microSD card slot up to 256 GB. And it's all packed in a thin body degan just 7.77mm thick with HD + screen and 19: 9 aspect ratio which is a full screen type or FullView Display. For the camera was quite good, where the rear camera has a 13MP sensor with f / 2.2 aperture and 5MP front camera with the same aperture is f / 2.2. Vivo Y81 also features face unlock and AI for photography. The battery itself is quite adequate for 3260 mAh. The operating system already uses the latest Android Oreo 8.1 and supports 4G connections, as well as supports DUAL SIM card.